Pixel Qi's magic transforming displays seemed too good to be true: One screen that's both a bright, full color LCD and a reflective, E-Ink quality display for reading in light. It is pretty damn incredible. It's not hard to see the overall trend with gadgets: They're being reduced almost entirely to the display. Which is why, in this near-future vision of a single tablet thing that does everything—computer, video screen, reader—what Pixel Qi's doing simply makes sense. If you're carrying something that's basically just a screen, and expect it to do lots of different things, a screen that adapts to precisely what you're doing is how it has to be. In the Pixel Qi display's current form, it's impressive, though nowhere near perfect. In its backlit LCD mode, it's just about as good as any other 10.1-inch, 1024x600 netbook display, except that the viewing angle seems more limited, before the color started warping. Head on, color seems solid. Though it won't win any illumination showdowns, it's plenty bright—Pixel Qi won't reveal how many nits it's at when running at full brightness. How it handled motion was a bit harder to gauge, given the quality of the available video clip. On the Lenovo S10 used as the demo unit, it immediately switched to the electrophoretic reflective mode—where backlighting is replaced by ambient light reflecting off the back of the screen. In that mode, it really is just as crisp as the Kindle for reading text. You can watch video in this mode too, though it's not exactly pretty (the point being you don't have to wait 10 years for the damn screen to refresh when you turn a page). They wouldn't speculate on how much battery life improves when you turn off the backlight, simply stating that it saves you 2 watts of power. 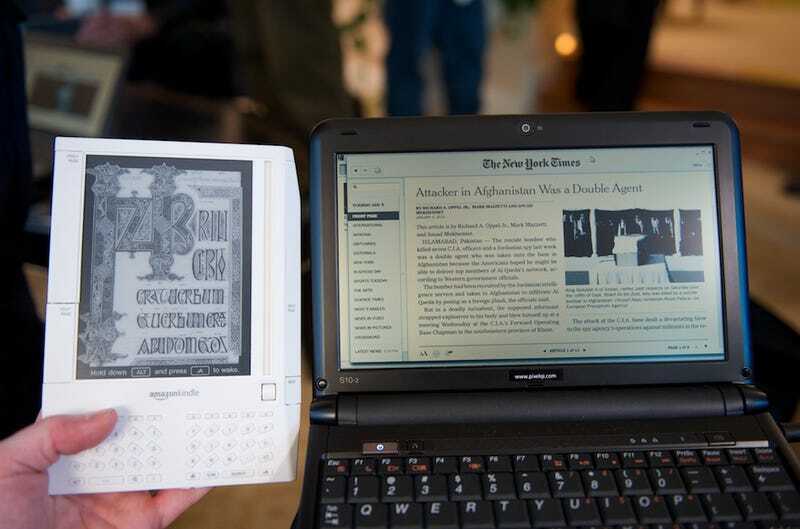 In a battle against e-ink, which has so many obvious limitations, this really is the projected winner. We still need to see this thing in a device that's capable of running for "days" without a recharge, but we are hoping for that soon. I'd say it's two generations away from being perfect enough—a wiiiider viewing angle, much higher resolution—for a truly finicky company to put these screens in their tablet or notebook, but it's clear, I think, that a screen like this one is the key to a future where everything is about the screen.